Dr. D.N. Parkes is Associate Professor in Geography at the University of Newcastle, Newcastle, New South Wales, 2308, Australia. Dr. I.H. Burnley is Senior Lecturer in Geography at the University of New South Wales, Kensington, New South Wales, 2033, Australia. Dr. S.R. Walker is Senior Lecturer in Geography at the University of New South Wales, Kensington, New South Wales, 2033, Australia. Research support for the papers presented in this volume was provided by the United Nations University, Tokyo. The Internal Research Allocations Committee of the University of Newcastle (IRAC) also provided two field research grants to Dr. Parkes. Research undertaken by Dr. Burnley and Dr. Walker was also facilitated by the University of New South Wales. Further support with field accommodation facilities and field research vehicles came from the North Australia Research Unit of the Australian National University. 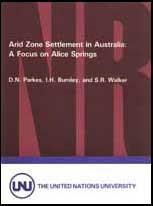 To these and the many other people in the Alice Springs region and Darwin, where the field research was conducted, the editor and authors express their gratitude. Very special thanks go to Professor J.A. Mabbutt, University of New South Wales, for his initial and continuing interest in the three projects reported here and for his comments on drafts of the papers and his ongoing enthusiasm to develop arid zone studies in Australia. This report was published within the framework of the United Nations University's Programme on the Use and Management of Natural Resources. The views expressed are those of the authors and not necessarily those of the United Nations University. Tel. : (03) 3499-2811. Fax: (03) 3406-7345. Telex: J25442. Cable: UNATUNIV TOKYO.